What does it say about me that I didn’t hate this book? 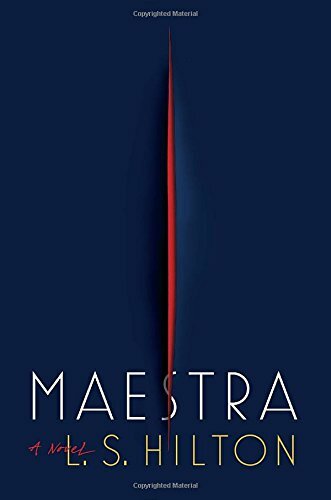 Maestra is destined to become one of those books that everyone reads, but no one wants to admit to reading. It’s brash, graphic, disturbing, and totally unapologetic about being all of those things. The plot is a convoluted mess, the narrator a sociopathic social climber obsessed with brand names and anonymous trysts. Still, despite all that, I read the entire thing in two sittings. It reminds me a lot of James Bond movies—if James Bond were a woman, and instead of working for the government, worked only to increase her own wealth and status. In fact, I think what makes this book feel so edgy is the simple fact that main character Judith is female. Identical actions performed by a male character would be so pedestrian as to be yawn-inducing—ooh, he kills someone and covers it up? He likes hooking up with strangers, no strings attached? He steals a valuable piece of art to pad his own pockets? He values people solely for how physically attractive or rich they are? Seriously, what part of this would sound at all shocking, if it happened in a book or movie in which the main character was a man? Still, I’m guessing Maestra is going to end up in a lot of beach bags this summer. It’s the kind of quick and dirty read that everyone wants while they’re on vacation, and it has enough shock value to ensure continued word-of-mouth buzz. You'll want to read it just to be in the loop when everyone is inevitably talking about it around the water cooler.